First edition of SIAL InterFOOD: promising success! Since its inception in 1964, “Salon International de l’Alimentation” or simply SIAL, has redefined the food trade by being an inspiring platform for industry professionals, both experts and professionals alike to discover the latest products and services in the market, explore new business opportunities, and forge relationships that all in all shape the future of the global food industry. Seeing Indonesia as an ideal gateway to the rest of the South East Asian region with its equally unique and distinct food culture and promising economic potential, SIAL InterFOOD first edition was very promising. 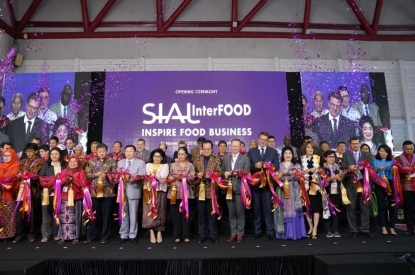 SIAL InterFOOD, which was held on November 11 to 14 (11 to 13 for the international hall), at JIExpo Kemayoran, proved to be a resounding success. Attracting nearly 40,000 visitors from 49 countries and more than 800 exhibitors from 24 countries, the B-to-B food and beverage event lived up to its claim of being the most inspiring exhibition in the region. SIAL InterFOOD 2015 was divided into 27 product and service categories which offered opportunities for product testing and demonstrations as well as offering many opportunities to discover innovative products, services and the latest worldwide trends. To officially mark the opening of the event, a ribbon-cutting ceremony was held on the morning of November 11th, opened by General Director of Industry Agro Panggah Susanto, Managing Director of KRISTA Exhibitions; Daud D. Salim, Chairman of Indonesian Food and Beverage Association; Adhi S. Lukman, Chairman of Indonesian Retail Merchants Association; Roy Nicolas Mandey, Chairman of Indonesian Hotel & Restaurant Association; Jakarta Krishnadi Kartawidjaja, SIAL Network Director; Nicolas Trentesaux, SIAL InterFOOD Regional Director; Joanne Cook; and other associations, joined by honorary guests. Apart from serving up the most extensive array of products and services, SIAL InterFOOD proved to be a gastronomic destination that offered visitors an entertaining and memorable experience with its line-up of features and activities which took place throughout the three-day trade event (4-day event for the domestic halls). A showcase of the market’s best innovations, SIAL Innovation is a product exhibition curated by a jury of food experts that puts a spotlight on outstanding new products that possess a true mark of innovation. After careful selection, 18 selected products were ultimately chosen as contenders for the prestigious Gold Award. The awards ceremony was conducted at the Gala Night celebration on the night of November 11th. . Bringing home the coveted Gold Award was Chesa Microwave Instant Cake by INDOFOOD SUKSES MAKMUR (International Export Division). Meanwhile, La Cuisine delighted attendees with in-kitchen demos by notable food service professionals and some famous Chefs such as Chef Juna, Chef Vindex, Chef Degan, Chef Henry Bloem, Chef Stefu Santoso, Chef Beng, Chef Muto, Chef Haryo Pramoe, Chef IB Parwata showcasing their culinary prowess by expertly preparing sumptuous recipes to the delight of the audience. SIAL InterFOOD also presented Baking and Cake decorating lessons with Chef Yongki Gunawan, Chef Gori, Chef Lanny Soechan, Chef Asep Kusno, Chef Yuliana Bisri, Chef Cessar, Chef Nyonya Liem, Chef Beng, Chef Juliana Jiu Dias, Chef Timothy and exhibitors. Other competitions hosted by SIAL InterFOOD: Cooking Competition, Classic Bartending Competition, Flair Bartending Competition, Service Rally Competition, Indonesia Barista Championship, Indonesia Latte Art Championship, Indonesia Brewers Cup, Indonesia Cup Tasters Championship, Cake Decoration Display and Demo Gelato. Various seminars with interesting themes were also held during the exhibition such as “Constraints and Opportunities of Herb Marketing in Indonesia and International” with the sub-theme “Opportunities and Challenges of Development of Traditional Medicine”; “Herb Branding”; “Ways Retailers approach the ASEAN Economic Community”; “Improve Your Retail Business Performance Through Personnel and Product Certification”; “The secret of Coffee, Apparently not just Lifestyle”; Wine & Spirits Blind Tasting Competition; and many more. 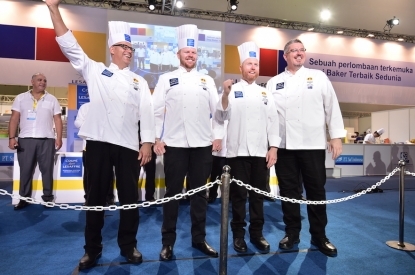 SIAL InterFOOD also welcomed the Asia Pacific selections of the Louis Lesaffre Cup, an International Bakery competition that saw, this year, the participation of Indonesia, South Korea, Vietnam, China and Australia to compete for a place in the World Finals - Coupe du Monde de la Boulangerie - that will happen in France in February 2016. Qualified countries from the Asia Pacific selections of the Louis Lesaffre Cup this year are China and South Korea. Last, but not least, visitors of this year’s food event had the privilege to witness the World Tour, which was flown in directly from Paris. A key SIAL event, World Tour gathers exclusive content prepared by 28 top food journalists to showcase the various food cultures around the world, its latest food trends and retail system. Going beyond the confines of conventional trade show presentations, SIAL InterFOOD matches expectations and industry standards as it delivers another ground-breaking exhibition bent on generating many economic opportunities to elevate the food market to global acclaim - solidifying its claim as the #1 annual food event not to be missed by the South East Asian food industry!